It’s the beginning of Birmingham’s short-lived heatwave. Tilt, the pinball bar, has its doors open and the clatter of the machines echoes into the street. The table is laid out with marker pens, various notebooks, and a black coffee. Juice Aleem arrives and orders a stout. Juice Aleem has been a key figure in the Birmingham hip hop scene since the mid-nineties. He’s fronted Big Dada collective New Flesh, hosted for Ninja Tune, and collaborated with Coldcut, Hexstatic, and Adam Freeland. 2016 saw the release of his album, Voodu Starchild, and a book on Afrofuturism. He is a director of B-Side Hip Hop Festival. This weekend, he joins Sid Peacock’s Surge Orchestra for a performance at mac to launch Surge in Spring II Festival. The performance is titled ‘Rivers of Love’. It’s a reflection on Enoch Powell’s infamous ‘Rivers of Blood’ speech, delivered fifty years ago this week in Birmingham. “In a way though I understand his speech. I understand some of what he was getting at, though it’s very right wing. The funny thing is, it was Enoch Powell that actually made the call to bring people over here, that’s what people don’t understand. He was the main person to say ‘Hey, Nigeria, India, Jamaica, Trinidad, come over here, come help.’ He was important in that call, and afterwards he was like, ‘ah…’ And that’s what the speech actually entails. It wasn’t necessarily saying don’t come, it wasn’t necessarily saying you have to go home now, but it was saying you have to wear a bowler hat. He talks about how people speak, and learning to speak the Queen’s English. I’m paraphrasing here but like, ‘if you’re going to be here, be here like us. Don’t be too… dark’”. When asked about the value of looking back at Enoch Powell’s speech, Aleem is quick to argue it’s cultural importance. “You have to analyse the past. That should be the reason we have history, not just to pass tests. I’m gonna quote Malcolm X: he says that most of the education we have is not an education, it’s an indoctrination. History especially – especially especially. Aleem’s own politics are rooted in the Afrofuturist movement. The author of 2016’s Afrofutures and Astro Black Travel: A Passport to a Melanated Future, he is eager to explain the label. “I think Afrofuturism – let me say straight off, I’m not concerned with that title. It’s just a name for an idea or a concept or an emotion, and we often give things names that we can’t necessarily contain within those letters. It helps people understand… like the film Black Panther. I’ve had people come to me and say, ‘I get what you’re on about now – I’ve just watched Black Panther and I get it’. 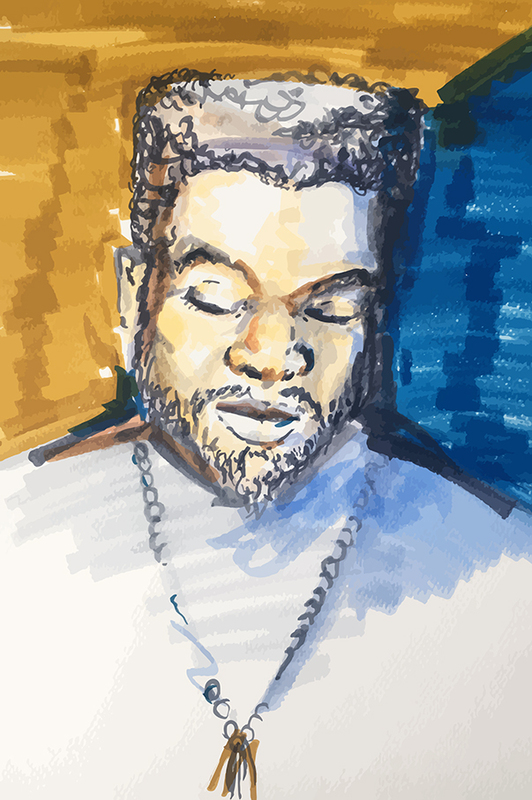 While we talk, I’ve been making sketches for a portrait of Aleem. He looks over at what I’m working on and asks if he can sketch me too. Producing a case of markers, he gets to work. Aleem’s art style is a reflection of him – bold, unapologetic, but always endearing. It echoes eighties comic books, a recurring topic in our conversation. I ask why he feels drawn to the medium. “I love Stan Lee and Jack Kirby,” tells Aleem. “Marvel not only made superheroes, they also took existing heroes because these aren’t owned by any copyright anymore, so you’ve got thousands of years of stories that you don’t have to pay for. You put Thor, the god of thunder from Norse mythology, you put him in to the premier superhero group of the sixties Marvel Comic Company, and this is perfect. Superheroes already exist in mythology. One of the first heroes in East African mythology, where some people speculate we get the word ‘hero’, is Heru, or Horus. He’s already a superhero by virtue: ‘Oh my parents are kind of like gods, and I did this and I conquered that and I came back from death…’ Well, you’re a superhero. If you explain an angel to somebody without using the word, it would sound like a superhero. In west African mythology you have things called the orishas which are like gods, spirits, but lesser than the supreme. They have different attributes, this one can control the water, this one can do that. We would call those beings superheroes. Juice Aleem is a font of knowledge on the lineage of the superhero archetype throughout civilisation. I ask him if it’s role within the Afrofuturist movement is a healthy one – does African/African Diaspora culture deserve a more varied representation in the future? “I think Luke Cage is a representation of the black everyman,” answers Aleem. “Obviously, the everyman that got put through a chemical process that gives him bullet proof skin and super strong muscle strength, which obviously happens to most people… Actually, as much as I down it a little bit, I think that’s what Black Lightning’s good for. He’s got powers, but he’s very much a school teacher. I think that’s the problem with the programme. All the crescendos of the story are based in almost too normal a storyline for an African-American family. For me, personally, I’m happy to escape that. Do I need another story about black gangs, black-on-black violence, drug dealing? I think I might have seen that already.